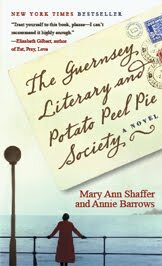 Before i picked up The Guernsey Literary and Potato Peel Pie society by Mary Ann Shaffer and Annie Barrows,i really wondered what a potato peel pie was.After reading the book,i know that it would probably be quirky but yummy-somewhat like the book itself. The year is 1946. The Place- London.Juliet Ashton is an author who tastes success with her book(collected works of the columns she wrote for a paper during the war). However,she runs into a roadblock and can't think of any new ideas for a new book.At this juncture,she receives a letter from Dawsey Adams of Guernsey who claims to be in possession of a book Juliet once owned herself. What follows is a wonderful exchange of letters and Dawsey tells her about the Guernsey society. Juliet wants to know more about this society and almost every member of the society writes to her telling her about their stories and how things were during the German occupation of the Island during the war. During this period in London, Juliet falls for an American publisher,not heeding the advice of her friends Sophie and Sidney. I am not going to tell you how the society got its name,because that's a charming story in itself. Each member of the society is so adorable that i had trouble picking my favourite.At times ,it was the sunny Juliet ;sometimes the quirky witch doctor, Isola and at times the strong-willed Elizabeth. The entire book is in the form of letters and notes and telegrams between people-both strangers and friends. Moving on..Over a period of time,Juliet realises that she has come to care about her new friends and wants to travel to Guernsey to meet them all and also explore the possibility of a book based on the wartime experiences of people in Guernsey. Mark Reynolds,who has been courting Juliet for a while presses her to get married to him and Juliet realises that she doesnt want to get into marriage so early on in the relationship.She spurns Mark and travels to Guernsey to meetsall the beautiful people who had written to her.What follows is more heart warming stories of the Islanders and her friends. As she collects information and interviews people,Juliet finds love and forms meaninful relationships that change her life. I really didn't think i would enjoy this book,given its saccharine treatment of the world war.But,i was wrong.I loved it. The story tends to sag a bit at times before Juliet travels to Guernsey,but that is only because of the format of the book.It is no doubt a beautiful book filled with spirited,warm charecters who you would want to visit and get to know better. Infact,after reading the book i was gripped with a strong inclination to write long winding letters to people i didn't really know. Ah!..the joy of finding a letter from a stranger in the letter box and tearing the envelope in haste to get to know more about the person!.Email and Facebook has ruined all the fun for our generation. The book was Mary Ann Shaffer's only book,and look what a masterpiece she's crafted!. Briefly after selling the book,Mary Ann fell ill and the book had to be rewritten according to the publisher's brief by her niece,Annie Barrows. Mary Ann passed away in 2008, a few months before her novel was published, but her words and spirit lives on in the pages of this wonderful book. 4.5/5 for this beautiful book.